I would like to show you an image which I recently completed and which received a full page in Ballistic's latest book [url=http://www.ballisticpublishing.com/books/elemental2]Elemental 2[/url]. After I did my first P-51D Mustang image, "Little Friends" over a year ago (seen [url=http://forums.cgsociety.org/showthread.php?t=189884]here[/url] in the CG Choice gallery), I got lots of requests from family of veteran pilots and Mustang owners for similar artwork. In the meantime I have finished a couple and here is the first. 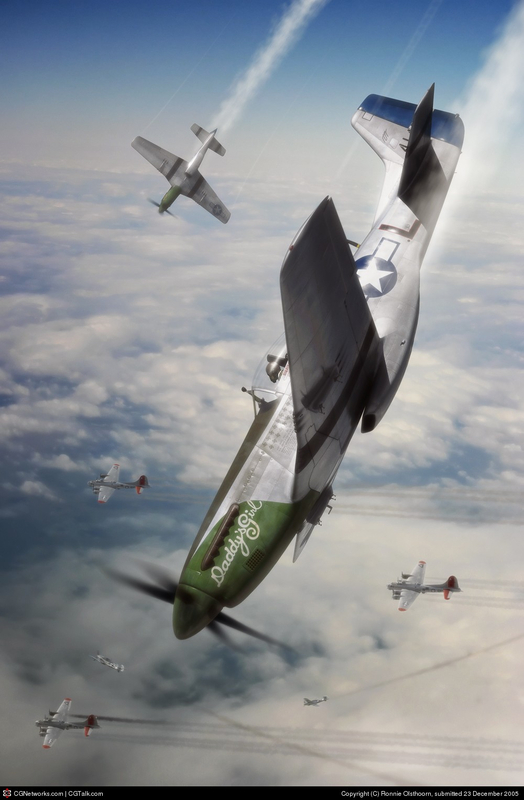 The aircraft depicted was flown by one of the top Mustang aces Captain Ray Wetmore. He named the aircraft after his first daughter and went on to score over 22 kills against the German Luftwaffe. Sadly Wetmore died in a flying accident in 1951. This artwork was made for his daughters and son, as well as the owner of a restored Mustang which flies in the exact colours of Wetmore's [i]Daddy's Girl[/i]. Next year I'll be back with more Mustang artwork and I'll also finish my [url=http://forums.cgsociety.org/showthread.php?t=285190]Corsair WIP[/url] of course!